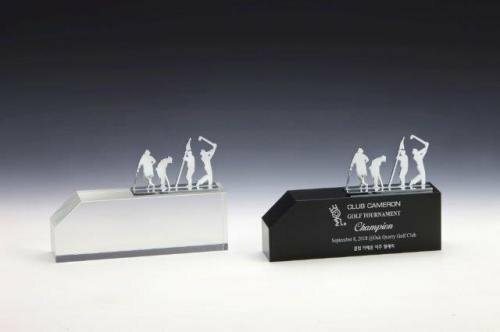 10" x 4" x 2-1/4"
11" x 4" x 2-1/4"
12" x 4" x 2-1/4"
Our Absolute Golf Trophy will be the only trophy you will use. Standing tall at 10" on our Large size, this simple but polished award has a multitude of uses. Constructed from premium black or clear optical crystal, a corner cut rectangular body is topped with a stand up image of golfers in action, made from chrome plated metal. 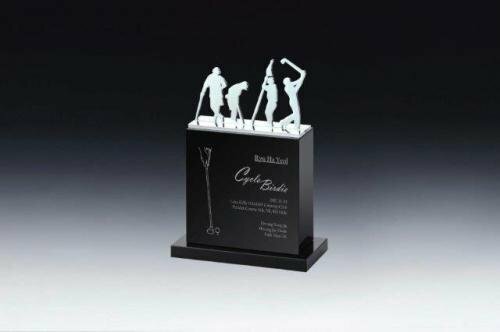 The body, which is made from black optical crystal, has a flat rectangle base, is topped off with a stand up image of golfers in action, made from chrome plated metal.